Go on an exciting ATV-ride to the Sólheimasandur DC3 Plane Wreck and hike on a glacier walk on Sólheimajökull glacier. Great value combo option! 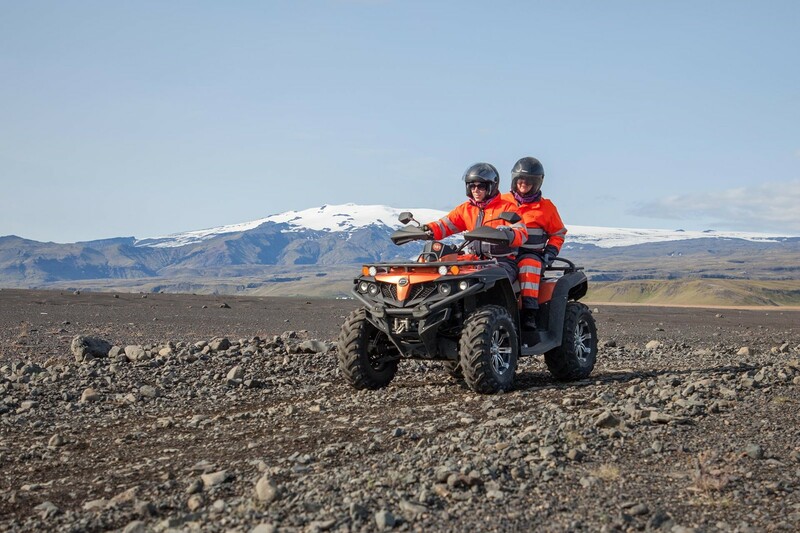 On this great-value combo tour, you start with an ATV/Quad-bike tour along the black sands of the South Coast, and then go explore the famous Sólheimajökull glacier on foot. You start your day at Arcanum Base Camp, where you meet your guide and get prepared for the ATV-tour. Your expert guide will lead you down to the black sands of Sólheimasandur where you will visit the famous and photogenic DC3 Plane Wreck. The ride itself is guaranteed to get your adrealine up, and the views will leave a lasting memory! After your ATV-ride, your next destination is Icelandic Mountain Guides Base Camp at Sólheimajökull. The drive between the two destinations only takes about 10 minutes and you will receive detailed driving instructions on the voucher if you book the tour. At Sólheimajökull, you will meet your glacier guide for the day, who will get you prepared and walk you to the glacier. After a brief safety instruction, you step onto the glacier where you will explore the many amazing and ever-changing features and ice sculptures. During the hike, your guide will educate you about the formation of the glaciers, their history and their role in the future of climate change. No technical skills are needed for this tour and all necessary equipment will be provided. Please note: The ATV tour is operated by our partners at Arcanum Glacier tours. To ride an ATV/Quad-bike, you need a valid driver's licence. Single riders and groups with odd numbers are required to book a single ride ATV. This tour is meet on location only. Hiking boots , boots that reach over your ankle are a must on our glacier walks. Other clothing should be picked according to weather that day. We advise dressing in layers.